Japanese Restaurant Roka on Charlotte Street (there is a new branch in Canary Wharf) is one of those places where it can be really difficult to get a reservation, especially on those ‘going out’ nights like Friday. I’ve tried booking on a number of times, and on each occasion I was told it was full. But I managed to achieve the seemingly impossible task of getting a table when I discovered that there is a bar seating area called the sushi and robatayaki counter which is open to customers on a first-come-first-served-no-booking basis. It’s located right in front of the chefs who cook on the open grill, and the best time to go to ensure a counter seat seems to be before 7.30pm. So for those who want to eat at Roka and can’t get a reservation, this is the route to try. In fact, when I turned up just after 7pm looking for a counter table, I managed to secure a table for 8pm.. This allowed time for a detour to the affiliated Shochu Lounge Bar in the basement area downstairs (shochu is a type of Japanese spirit, typically containing about 25% alcohol). They have an abundance of fabulous cocktails, a number of which contain shochu. The food menu is full of choices, but it’s always hard to pass up on a black cod marinated in yuzu (a citrus fruit) miso and homemade hajikami (ginger pickled in vinegar) (£22.60). 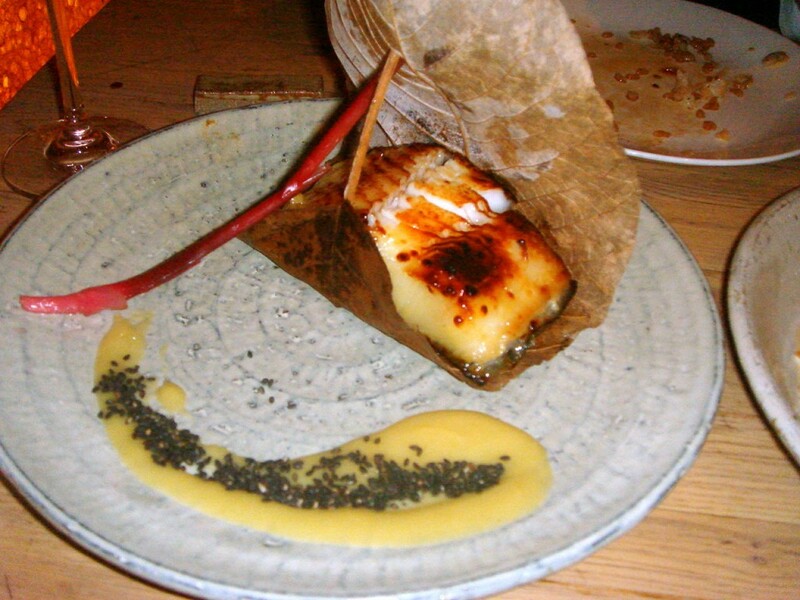 This was a lovely rendition of the classic ‘Nobu’ dish, with the cod being succulent and flaky. It oozed with lots of sweet, slightly sticky yuzu miso sauce. The cod features on the robata section of the menu. 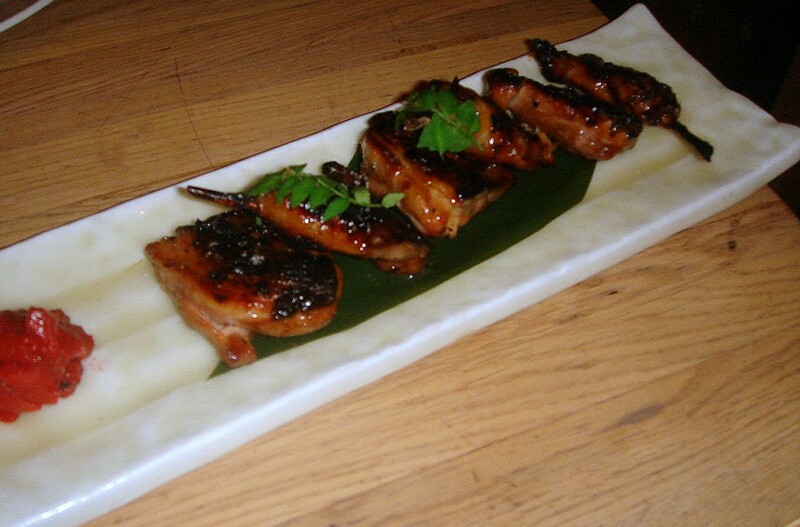 Roka is best known for its robatayaki, its open charcoal grill, and for this reason we made the rest of our selection from the robatayaki (the Roka menu also offers sushi, sashimi, special Roka dishes, snacks, soups and salads). We also had a quail marinated in plum wine and red miso (£11.60) where the slight tartness of the plum flavour worked well with the miso to give the quail a lovely finish. However the quail was slightly dry (easy to do as the bird is so small) and a touch less time on the grill would have left it moister. 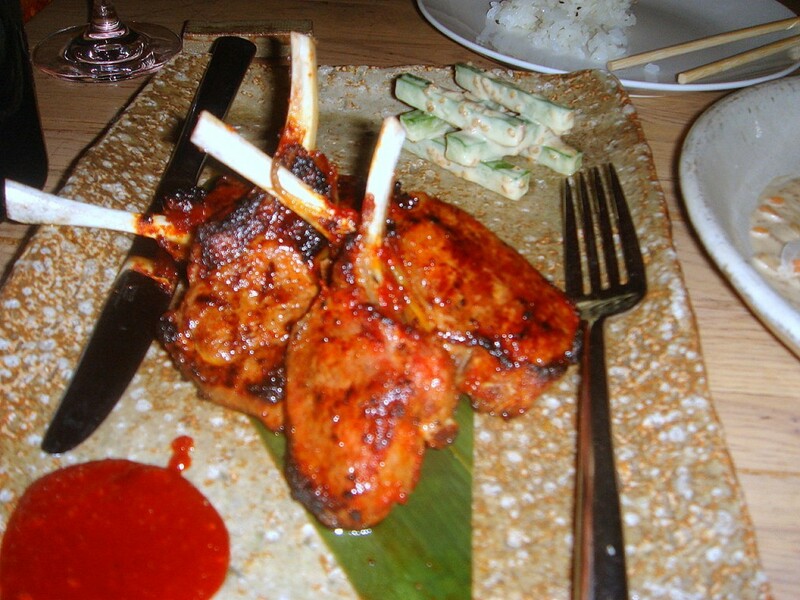 Lamb cutlets with Korean spices (£18.90) were very nicely spiced, giving the lamb a hint of exoticism. The meat was tender and succulent. Baby back ribs glazed with a spiced master stock and cashew nuts (£10.60) were tasty and tender with a slightly nutty, smoky decadent glaze. 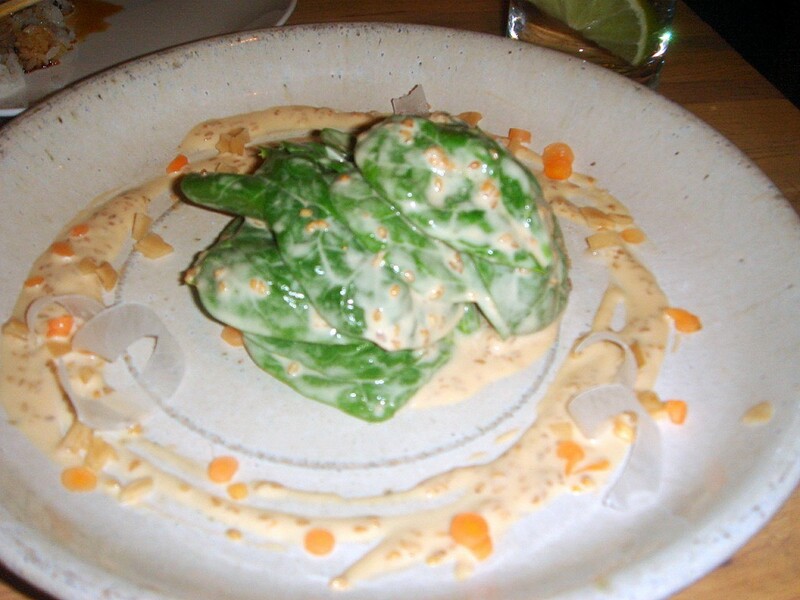 Spinach leaves with a sesame dressing (£4.90) were packed filled with the flavour of creamy sesame, although this dish on a whole was a little dull as it lacked aroma. We didn’t have dessert. As we had been distracted by fabulous cocktails in the Shochu Lounge Bar (another area where it is difficult to get a seat unless you book ahead), we started our meal late (after our 8pm allocated start time). There was a time limit on the table of two hours, and the restaurant was very strict about this, so we simply ran out of time for dessert. As it is difficult to get a table, there is the potential for ‘wait’ frustration at Roka, so the key seems to be to go early if you don’t have a booking. The décor is modern and urban, with clean lines and woody warmth. The place is generally full, so it’s abuzz with ambience and chatter. The service was good and we had a really lovely meal. The menu offers a varied choice, enticing enough to make me want to go back and try some of the other dishes. Price range: Depending on what you choose, average cost per head about £45 to £55. Excludes drinks and service. Hmm, tough choice for me between this and Dinings now. The food here doesn’t seem very Japanese though. It depends on what you’re looking for I think. 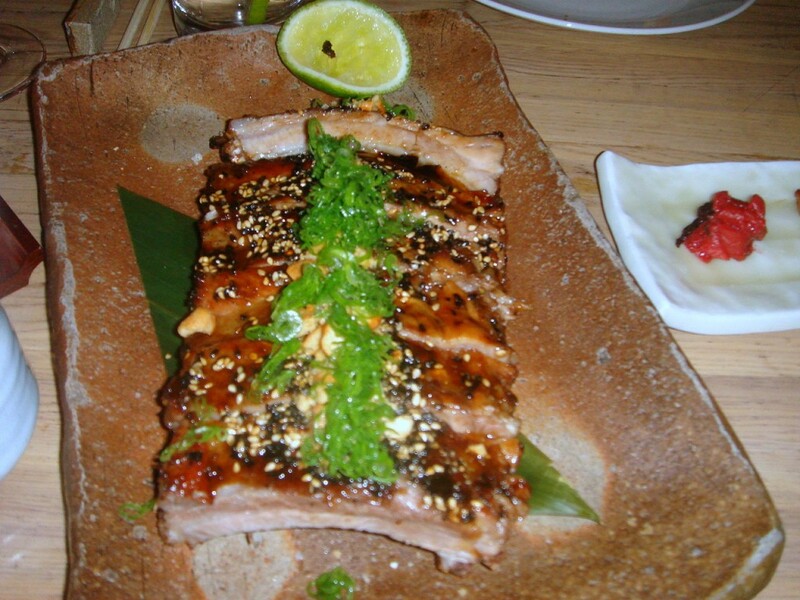 The food is more authentic at Dinings, but its more atmospheric at Roka. The food isn’t as authentic at the latter, but its tasty though. Dinings and Roka are both great. But Roka has a lot more wow factor. Neither are classic Japanese though either. My suggestion would be to have a few interesting pieces of sushi at Dinings and then get a cab over to Roka for their robata grilled main courses.